Accessible: Users can easily run tools without writing code or using the CLI; all via a user-friendly web interface. Reproducible: Galaxy captures all the metadata from an analysis, making it completely reproducible. Transparent: Users share and publish analyses via interactive pages that can enhance analyses with user annotations. We want to help you conduct your training seminars. You provide the training, we provide you training infrastructure at no cost. 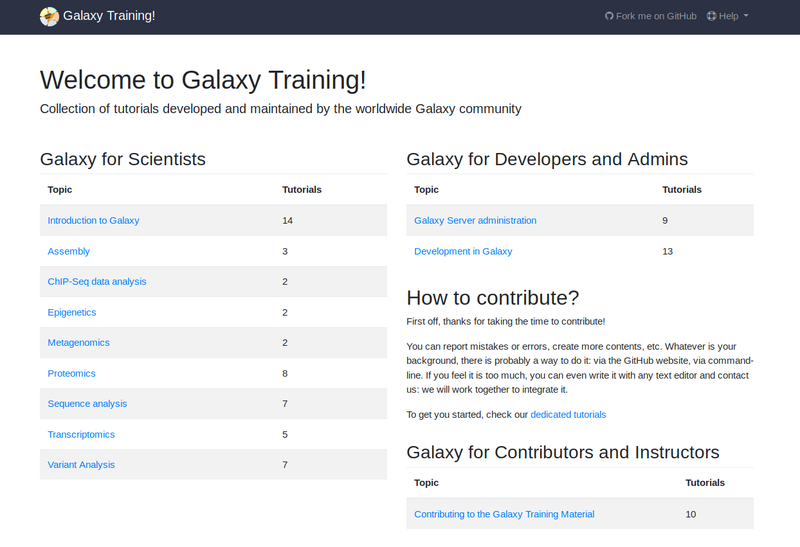 Why use UseGalaxy.eu training infrastructure? Simply fill out the infrastructure request form and we'll get back to you shortly. But we cannot always meet capacity, so we've put all of our training materials online. This has become a community project with people from all over the world contributing training materials. We are aiming to maintain high competency and provide high quality data analysis services to all our Galaxy users. Therefore we request that you acknowledge this service by including the members of the Freiburg Galaxy Team as co-authors if they have made a significant intellectual and/or organizational contribution to the work described (conceptualization, design, data analysis, data interpretation and/or input into drafting, revising or writing any portion of the manuscript). The authors acknowledge the support of the Freiburg Galaxy Team: Person X and Prof. Rolf Backofen, Bioinformatics, University of Freiburg, Germany funded by Collaborative Research Centre 992 Medical Epigenetics (DFG grant SFB 992/1 2012) and German Federal Ministry of Education and Research (BMBF grant 031 A538A de.NBI-RBC). Additional funding of projects and/or provision of material expenses are welcome as well, to help support our growing Galaxy community in Freiburg. We want you to feel that useGalaxy.eu is a reliable service, so we are promising to give you advanced warning (when possible) about upcoming downtimes or any events that might degrade the availability of useGalaxy.eu. User data on UseGalaxy.eu (i.e. datasets, histories) will be available as long as they are not deleted by the user. Once marked as deleted the datasets will be permanently removed within 14 days. If the user "purges" the dataset in the Galaxy, it will be removed immediately, permanently. An extended quota can be requested for a limited time period in special cases. Processed data will only be accessible during one browser session, using a cookie to identify your data. This cookie is not used for any other purposes (e.g. tracking or analytics.) If UseGalaxy.eu service is not accessed for 90 days, those datasets will be permanently deleted. The Galaxy service complies with the EU General Data Protection Regulation (GDPR). You can read more about this on our Terms and Conditions. 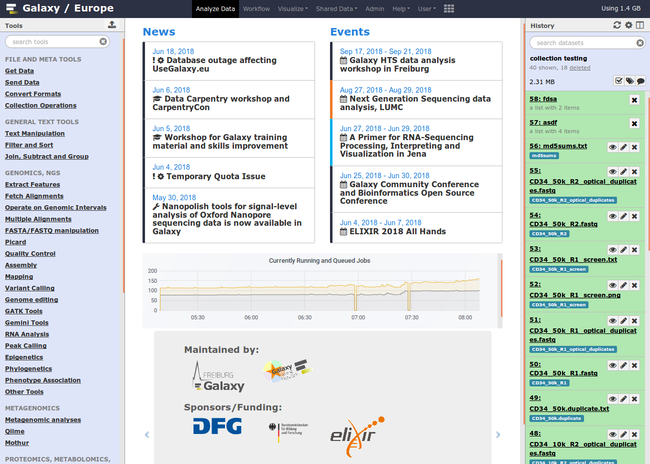 The maintenance and administration of UseGalaxy.eu is done primarily by the Freiburg Galaxy Team, an academic group. We work together with other academic groups across Europe and with the US Galaxy team. The Freiburg Team tries to maintain a balance between service uptime and the health of the administrators behind the service. Sometimes we are able to achieve this, sometimes due to factors outside our control, our service is temporarily inaccessible. UseGalaxy.eu hosts several domain specific versions of the usegalaxy.eu server. You can access any of these servers and find all of your data, with a set of tools focused on one specific domain. 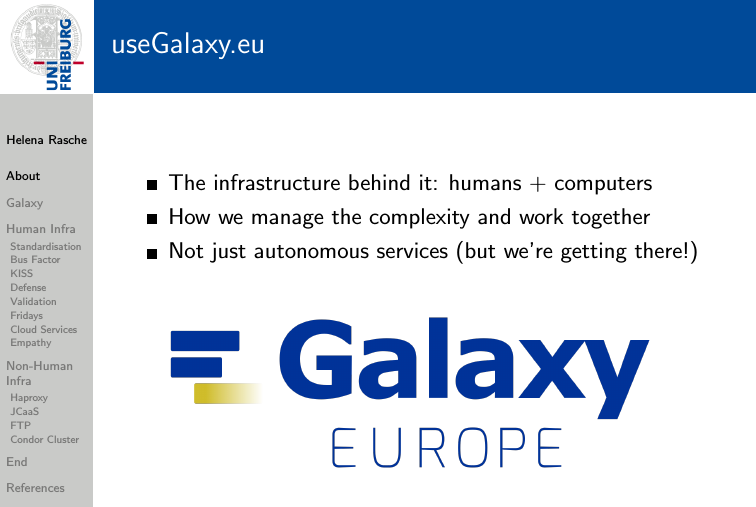 A sneak peak at the Galaxy Community Conference 2019 in Freiburg! We passed the 5.000.000th jobs and 5.000 users!